PXI Digital I/O Card, Modular - GX5733 | Marvin Test Solutions, Inc. 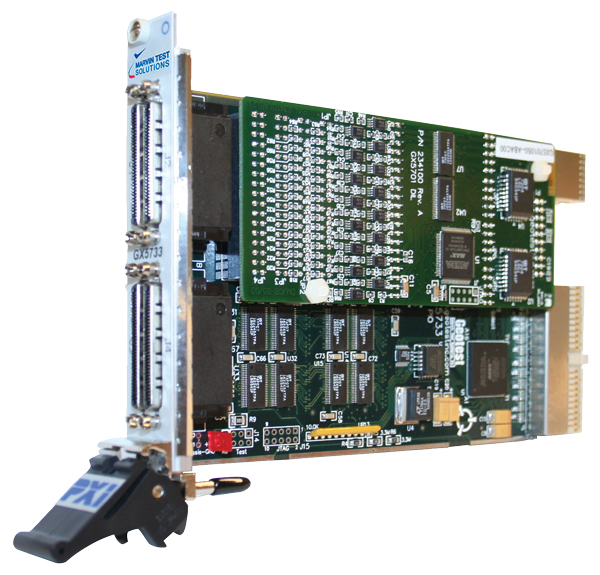 The GX5733 is a 3U modular digital I/O card that offers up to 128 I/O channels. Designed for ATE, data acquisition, or process control systems where a large number of discrete I/O channels are required, the GX5733 offers the highest channel density and flexibility in the industry for a single-slot, 3U PXI plug-in board. 96 channels support TTL levels and an additional 32 I/O channels can be customized by installing one of Marvin Test Solutions' GX57xx series I/O modules. Alternatively, the remaining port can be configured to support 32 TTL channels. The GX5733’s 128 digital inputs or outputs are arranged as four, 32-bit ports. Three of the ports provide 96 TTL levels and can be programmed for input or output in groups of 8. The remaining port can be used with a GX57xx I/O module and offers customized levels, handshaking, and on-board memory. The GX57xx expands the I/O capability of the GX5733 to 128 input or output channels. The GX5733 can accommodate one GX57xx module and provides custom I/O levels and functions. I/O modules provide between 16 and 32 channels with some versions offering on-board memory. The GX5701 provides 32 input channels with programmable threshold (-30 V to +30 V), handshaking for synchronization, and 16 KB of vector memory. The GX5702 provides 32 TTL output channels, handshaking for synchronization, and 16 KB of vector memory. The GX5704 provides 32 optically isolated Open-Collector Outputs capable of driving signals up to 50 V with 500 mA current sink capability, handshaking for synchronization, and 16 KB of vector memory. The GX5709 provides 32 RS-422 differential I/O channels. Direction is programmable in groups of eight. The GX5711 bi-directional I/O module converts 16 differential LVDS inputs to TTL outputs or 16 TTL inputs to 16 differential LVDS outputs. The GX5712 bi-directional I/O module converts 16 differential RS-422 inputs to TTL outputs or 16 TTL inputs to 16 differential RS-422 outputs.